Regular, white vinegar, aka White Lightning, has long been a staple in my house. I buy the largest container possible, which is usually the gallon size. No, I don’t use it much for cooking, most of it is used for cleaning and laundry. When I saw this article in This Old House I thought “OK, I bet I already use vinegar in these 10 ways”. What a surprise when I read the different uses and counted only 3 of the 10 that I currently use! Who would have thought about testing the alkalinity of your soil with vinegar? No doubt I will be adding the other 7 uses to my repertoire. I have contemplated one project for months now, trying to figure out an easy way to tackle it. I have a bathroom that features 1980’s vinyl wallpaper which is not what I would have chosen and, even worse, it was hung upside down! This will be the first wallpaper removal project and I feel as though this vinegar solution will do the trick…I’ll let you know. 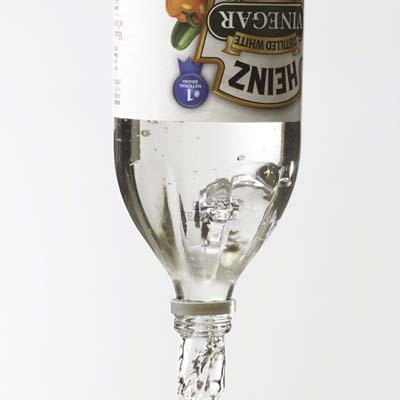 Here are 10 more uses for vinegar from Jennifer Stimpson in This Old House that you should find useful. If you have suggestions for any of these uses or some other unusual uses add yours to the comment section below. Using a sponge or spray bottle, saturate wallpaper with a solution of equal parts vinegar and water. Let stand for several minutes, then start scraping. The paper should come off easily. Place a handful of dirt into a small container and sprinkle vinegar on it. If it fizzes, the soil is alkaline; adjust the pH with an acid amendment. Pour ½ cup of warm vinegar into a resealable plastic bag. Drop in the showerhead, making sure the holes are submerged, and seal the bag. Let sit for 1 hour. Rinse and wipe clean, then reattach. Before painting galvanized metal or concrete, wipe down the object or surface with vinegar, using a sponge or lint-free cloth. This little trick will help your paint job last longer. Dab vinegar onto stubborn price tags and stickers affixed to glass, plastic, or wood. Scrape the surface clean, then rub the area with more vinegar to remove any sticky residue. On wood surfaces or furniture, use a mix of equal parts vinegar and water to remove buildup, wiping with the grain of the wood. For leather furniture, make a weaker solution—2 parts water to 1 part vinegar—and rub the material using a circular motion. For stubborn stains on ceramic-tile surfaces, scrub grout with a stiff-bristled toothbrush dipped in vinegar and watch it whiten before your eyes. CAUTION: Vinegar can harm marble and other natural stone surfaces, so avoid using on these materials. Test a small, unobtrusive area first if you want to be extra careful. Soak old tools and corroded nuts and bolts in vinegar for a few days. Rinse them with water and watch rust and scale disappear. Caustic ingredients in concrete, drywall, and other building materials can cause painful skin irritation. If you handle them often, rinse your hands with a mixture of 1 part vinegar to 2 parts water before washing up—the acid neutralizes their alkaline content. Next ›Shop Local, Help Local! I did use the vinegar for peeling wallpaper….with a little “elbow” grease and lots of warm water mixed with vinegar and determination, I got the wallpaper off… It Worked !!! !